Preprints (earlier versions) of this paper are available at http://preprints.jmir.org/preprint/6962, first published Nov 10, 2016. Background: Electronic health records (EHRs) are a rich resource for developing applications to engage patients and foster patient activation, thus holding a strong potential to enhance patient-centered care. Studies have shown that providing patients with access to their own EHR notes may improve the understanding of their own clinical conditions and treatments, leading to improved health care outcomes. However, the highly technical language in EHR notes impedes patients’ comprehension. Numerous studies have evaluated the difficulty of health-related text using readability formulas such as Flesch-Kincaid Grade Level (FKGL), Simple Measure of Gobbledygook (SMOG), and Gunning-Fog Index (GFI). They conclude that the materials are often written at a grade level higher than common recommendations. Objective: The objective of our study was to explore the relationship between the aforementioned readability formulas and the laypeople’s perceived difficulty on 2 genres of text: general health information and EHR notes. We also validated the formulas’ appropriateness and generalizability on predicting difficulty levels of highly complex technical documents. Methods: We collected 140 Wikipedia articles on diabetes and 242 EHR notes with diabetes International Classification of Diseases, Ninth Revision code. We recruited 15 Amazon Mechanical Turk (AMT) users to rate difficulty levels of the documents. Correlations between laypeople’s perceived difficulty levels and readability formula scores were measured, and their difference was tested. We also compared word usage and the impact of medical concepts of the 2 genres of text. Results: The distributions of both readability formulas’ scores (P<.001) and laypeople’s perceptions (P=.002) on the 2 genres were different. Correlations of readability predictions and laypeople’s perceptions were weak. Furthermore, despite being graded at similar levels, documents of different genres were still perceived with different difficulty (P<.001). Word usage in the 2 related genres still differed significantly (P<.001). Conclusions: Our findings suggested that the readability formulas’ predictions did not align with perceived difficulty in either text genre. The widely used readability formulas were highly correlated with each other but did not show adequate correlation with readers’ perceived difficulty. Therefore, they were not appropriate to assess the readability of EHR notes. Patient engagement and effective patient-physician communication are essential in patient-centered care, defined by the Institute of Medicine as “respectful of and responsive to individual patient preferences, needs, and values, and ensuring that patient values guide all clinical decisions” . Electronic health records (EHRs) are a rich resource for developing applications to engage the patients and foster patient activation [2-4]. Thus, allowing patients access to their own EHR records holds a strong potential to enhance patient-centered care. It may improve the understanding of their own clinical conditions and treatments, leading to improved health care outcomes (eg, increased medication adherence ). As patients express interests in reading their own EHR data , health care institutions have also begun to open up access to the EHR records . However, EHRs are written by physicians to communicate with other health care professionals . Therefore, EHRs are full of medical jargon, abbreviations, and other domain-specific usages and expressions that are ill-suited for the lay people (patients). One study showed that nearly two-thirds of the surveyed patients considered physicians’ notes difficult to understand, and radiology reports and nurses’ notes were also perceived as difficult . Another study recruited healthy volunteers to read and retell medical documents . Common retelling errors included misunderstanding clinical concepts and physician’s findings during a patient’s visit. In a study of electronic primary care records, many patients requested explanations of medical terms and abbreviations . A recent patient survey on Web-based access to laboratory results concluded that test result comprehension still needed improvement . Findings from an assessment of lay understanding of medical terms suggested that a substantial proportion of the lay public did not understand phrases often used in cancer consultations and that knowledge of basic anatomy could not be assumed . In the emergency department setting, patients understood less than 30% of commonly used medical terms . Moreover, the vocabulary gap between professionals and laypeople has motivated a thread of research to develop controlled vocabulary resources [14-16]. Merely providing patients with their own EHR records, therefore, does not necessarily help the patients better understand their own conditions. Further complicating the issue, it is estimated in the National Assessment of Adult Literacy that the average American has a reading level between the 7th and 8th grade . It is also reported in the same assessment that about 36% of the US population or 75 million Americans have basic or below basic health literacy. The opaque narratives in the EHR present a challenge to the average patient. Measuring the readability of the EHR notes is one important step toward making the notes accessible to the patients. Numerous studies [18-20] have evaluated the difficulty of health information intended for patient consumption using readability formulas. They conclude that the materials are often written at a grade level higher than common recommendations. However, the trust in these formulas to measure difficulty may be overextended. Grade-level readability formulas were originally developed to try to ensure that a school textbook for a particular grade was appropriate for children at that grade level . Their capabilities in measuring documents of a highly technical nature such as health care are not thoroughly validated. There are recent attempts to develop methods for text in the medical domain [22,23]. They have yet to enjoy wide adoption in the community, which may be attributed to the fact that efforts in learning models are inevitable. Numerous readability metrics have been used for the purposes of preparing texts for schoolchildren and language learners and ensuring smooth written communication. These metrics assess the grade level or the number of years of education needed for a person to understand the content. Here we briefly introduce 3 of the metrics. For more discussions on these traditional readability formulas, we refer the reader to the review in . Flesch-Kincaid Grade Level (FKGL)  predicts a grade level using the average sentence length and the average word length. Simple Measure of Gobbledygook (SMOG)  predicts readability based on the number of polysyllabic words (words with more than 3 syllables) and the number of sentences. Similarly, Gunning-Fog Index (GFI)  employs sentence length and the proportion of polysyllabic words. Detailed equations are shown in Multimedia Appendix 1. These metrics are also used extensively in the health care domain to measure the readability of patient handouts [18,28-30], Web-based health information for patients [19,31,32], medication inserts [33,34], informed consent forms [20,35,36], clinical trial information , and Wikipedia medical entries [38,39]. FKGL, in particular, is used in more than half of readability studies compared in one review . In general, these aforementioned metrics rely on the assumption that the longer the words and the sentences, the more difficult the text is. However, this assumption may not hold true for EHR narratives, which contain lists of clinical events (eg, medication list), abbreviations, and incomplete and short sentences, unduly lowering the readability score. One measurement that tailors to the medical domain was proposed by Kim H et al . This method compared surface text, syntactic, and semantic differences to predefined easy and difficult documents and reported normalized scores instead of grade levels. Another method for health text based on a naive Bayes classifier was developed . The authors collected training documents from Web-based blogs, patient education documents, and medical journal articles. Vocabularies in these documents were used as features for the classifier. Both of the methods relied on manually curated documents. Therefore, different choices in constructing the sets might result in variation in the scores or classification results. Moreover, the classifier was limited, as it assigned only 3 categories—easy, intermediate, and difficult, and did not assign a grade-level scale. Furthermore, the reference document sets were not available. Less research has been conducted on whether the readability grade levels predicted by these formulas or computational models agree with actual users’ perceptions of text difficulty. The objective characteristics are shown to not always align with user perceptions in other research fields. In one study, user perceptions of computer manufacturers’ websites were different from content analysis tools . In this work, we explored the relationship between users’ perceptions of text difficulty and the readability formulas’ output. We evaluated FKGL and other widely used traditional readability metrics. These metrics usually hinged on a few textual characteristics and did not take into account the domain of the text. We also explored the effectiveness of the existing readability formulas on predicting the users’ perceptions of difficulty. We hypothesized that the perceived readability of technical documents on complex topics was dependent on the domain of the text, not an absolute measure of the difficulty of a piece of text. We evaluated existing metrics for assessing EHR readability and investigated their utility in EHR notes. We used the open-source Java library Flesh 2.0  to calculate FKGL. In addition, we used the same program to calculate the number of sentences, words, and syllables, and then applied the other 2 formulas (SMOG and GFI). In the following sections, we first describe the data we used for evaluation, followed by an analysis of this corpus. Diabetes is a common disease that we can expect a large body of readers to be aware of and can provide reasonable judgments on readability. This is especially important in the EHR collection because randomly selected EHR notes may contain information about rare conditions, which can confuse the readers. The common theme of the content in the 2 sources also helps address the problem of variations of a user’s knowledge in different areas. By constraining to a single condition, we can limit the confounding effect of a user’s different levels of familiarity in different areas. aColumns labeled “all” include all documents. bColumns labeled “paired” include only documents where another one with a similar length and FKGL score is also available. Table 1. Document collection statistics. We recruited 15 AMT subjects to read and rate pairs of documents. The readers were screened to have English as their native language and be AMT master workers. Three readers had a high school diploma, 7 had an associate degree, 4 had a Bachelor’s degree, and 1 did not report education level. Each reader was presented with 20 randomly selected pairs of documents side by side on the computer screen. The 20 document pairs consisted of 5 pairs of wiki documents, 5 pairs of med documents, and 10 pairs of mixed-genre documents. The readers were requested to rate the readability of the documents on a scale from 1 (easiest to understand) to 10 (most difficult to understand). Each reader was given 6 hours to complete the task, and was not explicitly prohibited from using external resources. On average, they finished the assignment in 1 hour. Figure 1 is a screenshot of the interface with a mixed-genre pair. Figure 1. Screenshot of the interface for the Amazon Mechanical Turk (AMT) users. We first analyzed the empirical distribution of AMT users’ ratings on the text difficulty and compared it with the empirical distribution of the readability formulas’ scores. We next measured correlations between different AMT users. For each user, all the documents that he or she provided a rating were collected. Since the document pairs were randomly assigned, in general no 2 users worked on an identical set of documents. Only a subset of the documents were rated by any 2 users. On average, a document was rated by 2.3 users. Between 2 users, 8.6 documents were on average rated by both. We calculated correlations for a user’s and any other user’s ratings on the documents that were rated by both. The average for each user was obtained by first transforming the correlations by Fisher z-transformation, and then back-transformed . Document genres were not separated in the calculation; otherwise, it would result in too few instances. To evaluate traditional readability formulas’ applicability in technical documents, correlations between each AMT user’s ratings and the 3 readability formulas were measured separately for the wiki and med genres. The average over each user’s correlations were also obtained by Fisher z-transformation. 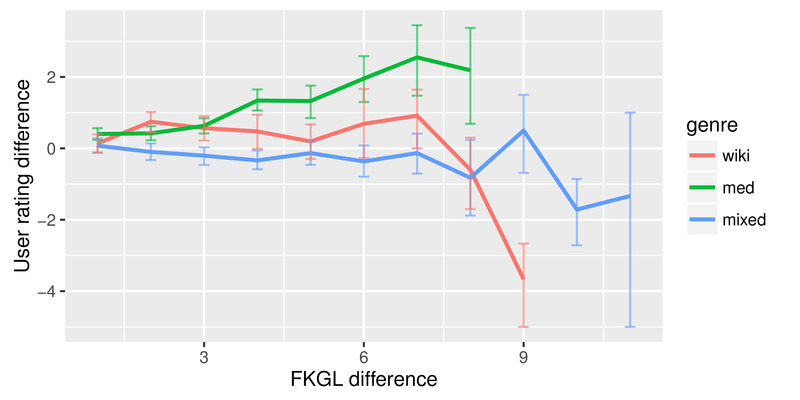 To validate the generalizability of FKGL to different genres of text, we tested whether users perceived a difference when the readability scores were similar. The AMT users in our experiments were presented with documents of comparable difficulty (within a difference of 0.5) according to FKGL and of similar length (within 50-token difference). 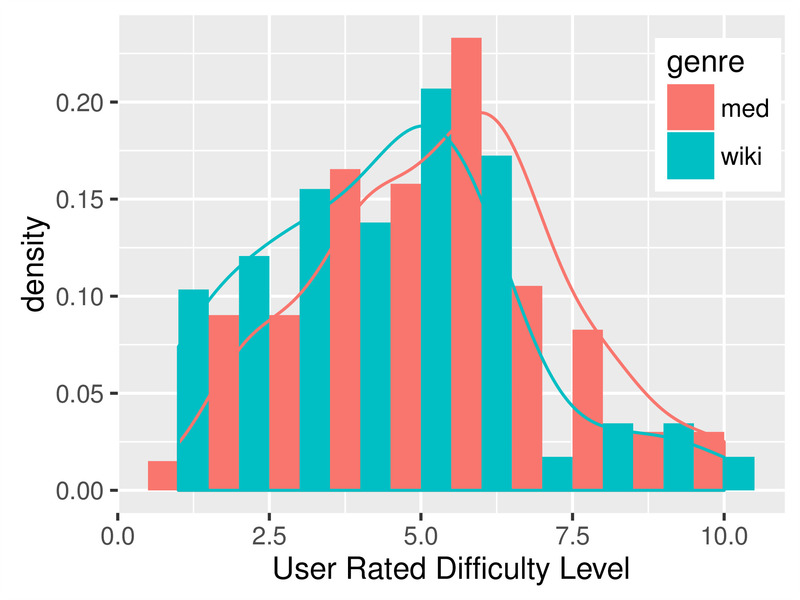 We tested the statistical significance of the difference between the difficulty values assigned by the users to 2 similar documents, separately for wiki, med, and mixed pairs. Two statistical tests are employed—Wilcoxon signed-rank test and Kolmogorov-Smirnov test. We also tested the generalizability of 2 other formulas using the same procedure. Among all of the document pairs, we selected the subset of document pairs in which the SMOG scores were within 0.5 between each pair. The same process was repeated using GFI scores. Furthermore, we explored the disparity in users’ perceived difficulty when a readability formula reported a difference between 2 documents. For each user, we generated pairs of documents from all of the documents he or she rated and then removed the pairs that were presented during the AMT work session. These document pairs were separated into 3 types based on the genres of the documents, as in the previous experiments. 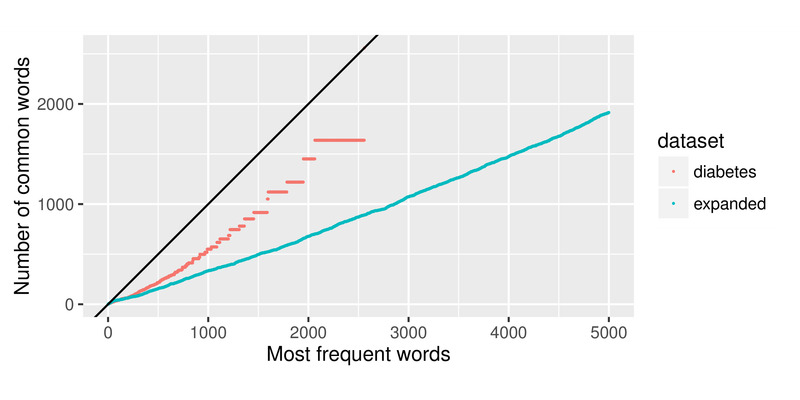 Since FKGL, SMOG, and GFI all involved similar variables (sentence length in words or polysyllabic words, word length), we examined the correlations between different readability formulas on the 2 genres of text in our dataset. Many studies adopted more than one of the traditional formulas to ascertain readability grade level on documents intended for patient consumption [44-49]. Analyzing the formulas’ correlations would inform us of this approach’s utility. We compared the word usage patterns in the 2 genres of text by examining the common words. First, words in both med and wiki sources were ordered by the frequency in which they appeared in their respective genre. Then, the common words that were in both genres of text in the top frequently used words were counted. The shared vocabulary size might reveal a difference in word usage in different text genres. Medical jargon is one of the barriers for the patient to understand health information. The eligibility criteria in clinical trials are found to be too difficult for the average American population, mainly due to the frequent use of technical jargon . One study has shown that linking medical terms in EHR notes to Wikipedia pages can improve patient’s comprehension . Moreover, many methods have been proposed to identify important or potentially unfamiliar medical terms [52,53]. We explored the effects of the medical concepts by measuring the correlation between users’ ratings and the number of concepts. Medical concepts were identified by running MetaMap  and excluding concepts from the following semantic groups and types: Activities & Behaviors, Concepts & Ideas, Geographic Areas, Objects, Occupations, Organizations, Age Group, Animal, Family Group, Group, Human, Patient or Disabled Group, Population Group, Professional or Occupational Group, Educational Activity, Health Care Activity, and Research Activity. These semantic groups and types usually do not contain technical medical jargon, and are uncommon in EHR notes. We also excluded Anatomical Structure because in our dataset almost all terms in this category were “body,” with the rest being such common body parts as “head” that would not pose difficulty for an average reader. 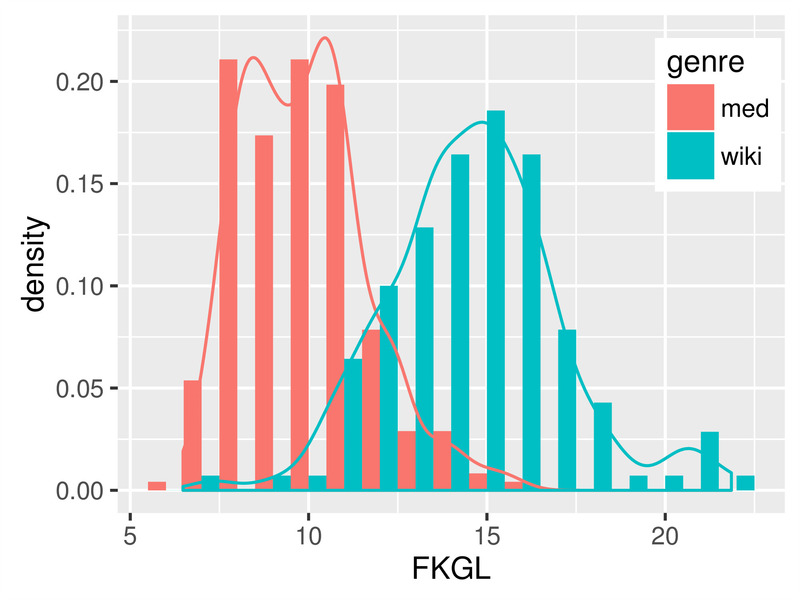 Empirical distributions of the FKGL readability scores and users’ ratings are shown in Figures 2 and 3. The FKGL histograms (Figure 2) on the 2 genres have clear distinctions. However, contrary to the general belief that EHR notes are more difficult to read, the histogram on the med data peaks to the left of the wiki data histogram. The users’ ratings (Figure 3), although to a smaller degree, show a higher difficulty level for the med than for the wiki data. Table 2 shows the average score of each readability formula and the AMT users’ ratings. All of the 3 readability scores suggested that the technical EHR notes were significantly easier than lay language wiki articles, whereas the AMT users rated the opposite—wiki articles were 21.31% harder than EHR notes. These results suggested that although FKGL might distinguish the readability of different genres, its counterintuitive predictions could lead to underestimation of difficulty levels on highly complex documents. bSMOG: Simple Measure of Gobbledygook. eAll differences in scores between the wiki and med genres were statistically significant at level P=.01 (Mann-Whitney U test). The second to last row shows that the percentage med score was higher than the percentage wiki score. Table 2. Average readability score and users’ ratings. Figure 2. Histogram of Flesch-Kincaid Grade Level (FKGL). Figure 3. Histogram of Amazon Mechanical Turk (AMT) users’ ratings. Table 3 summarizes the correlations between 2 users’ ratings. Most users showed moderate or strong correlation with other users, suggesting that the AMT users’ perceptions of difficulty were congruous among themselves. Table 3. Average correlations between a user and everyone else. Table 4 shows the average correlation coefficients between an AMT user’s ratings and the 3 readability formulas’ output. All the correlations were very low, especially in the med category. The SMOG and user rating correlation on wiki data, although slightly higher than that of FKGL and GFI, was barely moderate. The low correlations suggested that users’ perceived difficulty levels were inconsistent with the readability formulas’ predictions. 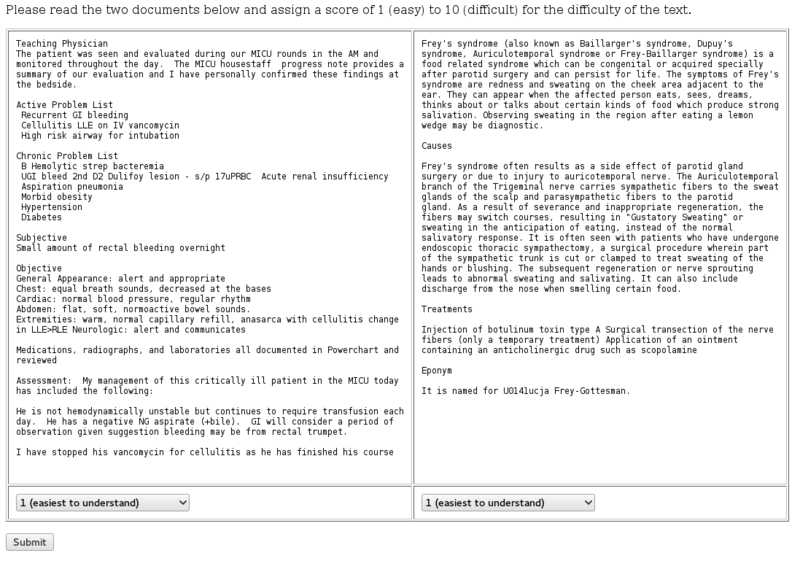 For example, one user consistently assigned low difficulty levels to documents with FK scores 12–16. However, another user’s scores for documents with FK levels approximately 13.5 varied considerably. In contrast, the difficulty perceptions among different users were highly consistent (Table 3). Table 4. Average correlation between users’ ratings and readability formulas. This pattern of inconsistency highlighted the inadequacy of these formulas’ utility in measuring EHR readability. It also highlighted their weakness in testing readability of documents of complex topics such as medicine, as they were developed to help users in the education community to gauge text difficulty below 12 grade. All 3 formulas relied on word counts and sentence counts to estimate text readability. The implicit assumption that longer words were more difficult, however, could often be violated. For instance, abbreviations that were not normally used outside the medical domain, such as “CHF” (Congestive Heart Failure) and “EKG” (electrocardiogram), were prevalent in EHR notes, without full definitions. Because these short abbreviations often comprised very few, if any, syllables, they would have exactly the same impact on the readability score as did the common stop words such as “the.” However, the abbreviations were obviously one of the barriers for a patient to understanding an EHR note. Furthermore, many abbreviations were ambiguous. For example, “MI” can be the shorthand for both “myocardial infarction” and “myocardial ischemia,” 2 different clinical conditions. In fact, disambiguating these abbreviations has been actively studied [55,56]. Finally, SMOG and GFI’s use of polysyllabic words could also exacerbate the problems with abbreviations. For example, “COPD” might be considered a 1-syllable word in calculating FKGL, but it would make no contribution to the calculation of SMOG or GFI. Table 5. Statistical significance of difference in AMT users’ perceived difficulty between documents of similar Flesch-Kincaid Grade Level. The P values for a pair of same-genre documents showed that the users’ assignments were not significantly different, consistent with the traditional formula’s assessment. However, the P value for a pair of documents from different genres indicated that despite being assessed at similar difficulty, actual users perceived them as significantly different in terms of readability. Kolmogorov-Smirnov test (Table 5) also showed the same trend. The same tests, when repeated on a subset of document pairs whose SMOG or GFI score difference was within 0.5, confirmed that they were not generalizable to different text domains. Detailed significance test results are displayed in Multimedia Appendix 2. AMT users’ perceptions of difficulty varied depending on the genre of text, even though a readability formula shows no difference. We then explored the disparity in users’ perceived difficulty when a readability formula reported a difference between 2 documents. Figure 4 shows the average difference in users’ ratings on a pair of documents with varying differences in FKGL scores. Figure 4. Average user’s rating difference on 2 documents of different Flesch-Kincaid Grade Level (FKGL) scores. Error bars are bootstrapped 95% CI. For a pair of EHR notes, as the difference in FKGL scores widened, AMT users’ rating difference also gradually increased. However, the users’ ratings were limited to at most 2.5 levels difference even for large FKGL differences. For a pair of Wikipedia documents, AMT users’ rating difference varied slightly within 1 level. These patterns suggested that in a wide range of FKGL scores, users’ ratings did not agree with FKGL. A similar trend was present in a mixed pair of documents: AMT users’ rating difference stayed close to 0. The limited difference in AMT users’ ratings indicated that FKGL scores did not align well with user perceptions across different genres. The correlation coefficients between different formulas confirmed that all 3 formulas were strongly correlated on our dataset regardless of text genre, consistent with the findings from previous studies [57,58]. Detailed plots and table showing the correlation are displayed in Multimedia Appendix 3. The substantial correlation implied that there was limited utility in employing multiple formulas, especially those relying on word and sentence lengths, to reduce potential bias of the individual ones when assessing text readability, as is often done in research studies [44-47,59]. In 2 similar corpora, the N most frequent words from each corpus would be similar. Therefore, the number of common words would increase at approximately the same rate as more frequent words were examined from the 2 corpora. Significant deviations from this pattern were indications of different word usage patterns. As shown in Figure 4, in our set of diabetes documents, the rate of increase in common words between wiki and med documents was significantly smaller (at the level P<.001) than 1 (shown as the solid line in the figure). This suggested that the word usage patterns in the technical (med) and lay language (wiki) documents on the same topic were different. Expanding to more topics, we built the same word frequency statistic in all Wikipedia articles and about 100,000 EHR notes. Shown in Figure 5 as the “expanded” collection, the slope of common word count was also significantly smaller than 1 (at the level P<.001). Figure 5. Common words in the med and wiki genre texts. The correlation coefficients between the number of medical concepts and user difficulty ratings, shown in Table 6, were measured for each user and averaged. The average correlation was again obtained by Fisher z-transformation. Correlations with unique concepts were slightly higher than correlations with all concepts in both med and wiki texts. More unique medical concepts were likely to result in more cognitive load for a user to comprehend. It was also worth noting that EHR notes showed a lower level of correlation than the Wikipedia documents. This could be in part attributed to the multitude of complexities of EHR notes not limited to the abundance of technical jargon. Writing style such as choice of words and textual cohesion might also account for some of the variances in the difficulty in perceptions of EHR notes. In spite of the differences, these correlations suggested that medical jargon was a substantial contributor to readers’ perceived difficulty of both genres of text. Table 6. Average correlations between users’ ratings and number of medical concepts. We evaluated 3 widely used readability formulas’ predictions of text difficulty and their correlation with users’ perceived difficulty. Our results showed that although the formulas’ predictions were highly correlated, they did not align well with user perceptions. Furthermore, despite being graded at similar levels by a readability formula, documents of different genres were still perceived with different difficulty. Numerous studies have used the traditional readability formulas to evaluate a variety of information sources for patients. Many conclude that the materials intended for patients to improve understanding of their health conditions are too complex, exceeding the recommended grade levels for this purpose. Some also suggest areas of improvements to help align the documents to recommendation levels. Unlike these studies that focus on documents mainly for patient consumption (patient handouts, education materials, Web-based information sources), we aimed to provide insight into users’ perceptions of EHR notes readability. EHR notes are foremost a tool for physician communication, and a large portion of them are not originally written with easy patient comprehension in mind. However, they are shown to be beneficial to the patients. As more institutions allow patients access to their own EHR records, patients are also interested in reading them. Research has shown that patients may need help in understanding them. An accurate readability metric for the EHR notes can encourage physicians to write notes in a simpler language. It may make patient portals more useful. For example, it can be helpful in EHR record presentation by highlighting the easier ones that are within a patient’s reading capabilities and providing comprehension assistance on the difficult ones. Such a metric may also enable the assistance tools to locate education materials that are easier to read than the EHR notes. We noted that readability was not the only factor affecting patients’ comprehension of EHR notes. For example, reader interest and motivation have been pointed out in the literature to be a factor contributing to comprehension . In a more realistic scenario where patients read their own EHR notes, they are likely to be motivated and show interest in knowing their own health conditions. Comprehension may also depend on a user’s existing knowledge of the subject matter. Since we evaluated on many anonymous AMT users, the bias in individual prior knowledge was reduced due to such a random selection of participants. Nonetheless, higher readability could facilitate patient comprehension. Existing formulas are widely used in the health domain, but our analysis suggested that they were not accurate when applied on complex documents. A better metric should incorporate features beyond simple word and sentence length, such as the complexity of the concepts involved in the document. Developments in computer science have led to new methods that utilize statistical language modeling and machine learning to predict text readability. For example, readability levels are modeled as a linear combination of a unigram language model and a normal distribution-based sentence length model . This approach is expanded by introducing smoothing into the language models . A Support Vector Machine model to assess text readability is proposed in  to learn from features including syntactic information such as noun phrases, traditional readability formulas, and language models. However, language model-based approaches do not receive so widely an adoption in the medical domain as the traditional formulas. This can be in part due to the need to learn a language model, a much more involved task than using a formula. FKGL and other formulas, on the contrary, are readily available, free of charge, and easy to use . We will explore these new models’ performance in differentiating user perceptions of difficulty in the future. Our analysis was based on recruiting volunteers from AMT to evaluate readability of EHR records. Having patients directly perform this evaluation might represent a more realistic user experience. The patient, through his or her interactions with a health care professional, might have a better context than an AMT user to rate his or her own record’s readability. In our study, to mitigate the problem, we selected documents based on a common condition. Our sample documents were from one condition, selected to provide some context so that users would not be surprised by an unfamiliar topic. Thus, the user’s prior knowledge might affect their ratings of text difficulty. There are several other avenues we plan to pursue in future work. Clustering users based on their pre-existing knowledge may reveal readability formulas’ differing capabilities in predicting users’ perceptions of difficulty for different populations. We also plan to develop new methods that can better capture the readability of complex technical documents so that both health care providers and patients can benefit from focusing first on EHR notes that are at an appropriate difficulty level. Studies have shown that providing patients with access to their own EHR notes may lead to improved health care outcomes. Measuring the readability of the EHR notes is an important step toward making the highly complex and technical narratives accessible to the patients. Despite being widely used in the health care domain, existing readability formulas are not thoroughly validated for their appositeness in this domain. In this study, we evaluated several such formulas’ abilities in predicting perceptions of difficulty in health-related text from Wikipedia and EHR notes. We collected AMT users’ ratings on text difficulty from these 2 different genres. Word usage in the 2 genres differed significantly despite their sharing a common topic. We found that the readability formulas’ predictions did not align with perceived difficulty in either text genre. Furthermore, there was significant difference in the user’s perceived difficulty in the general English and medical language when similar scores were predicted by readability formulas. Therefore, the widely used and highly correlated FKGL, SMOG, and GFI readability scales did not show adequate agreement with human ratings, and thus were not appropriate to assess the readability of EHR notes. This work was in part supported by the Investigator Initiated Research 1I01HX001457-01 from the Health Services Research & Development Program of the US Department of Veterans Affairs, and in part by the Center for Intelligent Information Retrieval. The content is solely the responsibility of the authors and do not represent the views of the US Department of Veterans Affairs, the US Government, or the Center for Intelligent Information Retrieval. Details of the readability formulas evaluated. Statistical significance of the difference in AMT users’ perceived difficulty between documents of similar SMOG or GFI levels. Correlations of grade levels from different readability formulas. McLaughlin GH. SMOG grading-a new readability formula. Journal of reading 1969;12(8):639-646. Gunning R. The technique of clear writing. New York: McGraw-Hill; 1968. Zheng J, Yu H. Key concept identification for medical information retrieval. 2015 Presented at: The Conference on Empirical Methods in Natural Language Processing; 2015; Lisbon p. 579-584. Štajner S, Evans R, Orasan C, Mitkov R. What can readability measures really tell us about text complexity. In: Proceedings of the 8th International Conference on Language Resources and Evaluation. 2012 Presented at: LREC Workshop on natural language processing for improving textual accessibility; 2012; Istanbul, Turkey p. 14-22. Van Oosten OP, Tanghe D, Hoste V. Towards an improved methodology for automated readability prediction. : European Language Resources Association (ELRA); 2010 Presented at: The 7th Conference on International Language Resources and Evaluation (LREC); 2010; Malta p. 775-782. Si L, Callan J. A statistical model for scientific readability. 2001 Presented at: The tenth international conference on information knowledge management; 2001; Atlanta p. 574-576. Schwarm SE, Ostendorf M. Reading level assessment using support vector machines and statistical language models. 2005 Presented at: The 43rd Annual Meeting on Association for Computational Linguistics; 2005; Ann Arbor p. 523-530. ©Jiaping Zheng, Hong Yu. Originally published in the Journal of Medical Internet Research (http://www.jmir.org), 02.03.2017.